Google's Street View imagery is typically found outside and only on the ground floor. But now, Cube Cities enables Street View from any building floor with our Verticode geospatial matching platform. With Verticode, we can link any interior Street View panorama to any floor or specific window on a building. 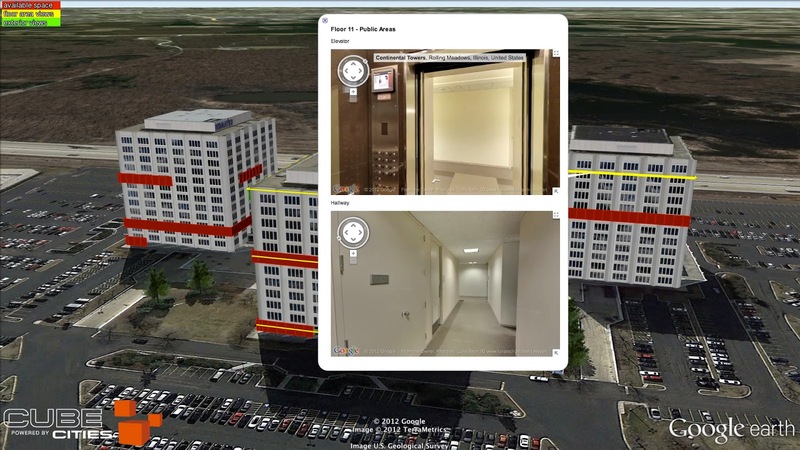 1-click puts the user immediately on the roof or inside a room and allows them to navigate through hallways, boardrooms and elevators with the familiar, easy to use Street View interface. The video below shows how a suburban Chicago office building uses Street View imagery to assist with marketing efforts. Understanding floor plans and interior layouts becomes much easier with this rich information source instantly available. It's simply an obvious way of communicating what's actually happening inside a property. Street View imagery and floor plans for this video have been provided by Luna Tech 3D. That's really excellent. Fantastic work.